My hidden treasures, the original source of my happiness. As you can see in my personal journal, I am still not entirely stable after the jaw surgery. I got a mild fever and malaise for a while today. When I stopped shaking enough to be able to read, I fetched a book I have brought with me since my younger years, when I was in the Christian Church of Brunstad. As you may know, this was my home, more so than any physical place. It was, for the longest time, far from me that I would ever part ways with the Church, where the Truth was taught without reserve. All one wanted to know about the godly life was laid out plainly, and there was nothing to hold anyone back from growing in all goodness and holiness and purity, for the duration of our life. Things changed a bit toward the end of my time there. A modernization, I guess you could call it. I wonder if they ever changed back. In any case, I brought with me the books from the old time. I have given away novels beyond counting, but the books from the Church are still with me. And it was one of them I pulled out of the shelf when I was once again able to control my body. It was the collection of articles by Johan Oscar Smith in the Christian magazine he started in 1912, and which I believe is still running: “Skjulte Skatter”, or “Hidden Treasures” in English. To this day I cannot see those words used without thinking of that small, simple magazine – simple in layout, but so rich in content. Smith died long ago, during World War II, but his words are still alive. At the time the magazine started, it was around a decade since he became a Christian. He had grown up in a Christian country – as Norway was at the time – and in a God-fearing family; yet like many other young men, he was not personally a Christian. One good thing about our culture is that people generally are not expected to be a Christian just because it is the prevailing religion: It is expected that one chooses to be a “personal” Christian, or not. Those who don’t are free to live as they want, as long as they don’t break the laws (or only small laws), but a “personal Christian” is held to much higher standards. So people don’t do this unless it is important to them. So also back then, although it was more common than now. But in any case, Jesus Christ has lived and inspired Johan Oscar Smith with a wisdom that is quite rare in any generation. Certainly there have been more wise men in the world than I thought when I was young, and particularly compared to me! But even so, I am amazed when reading much of what he wrote back then. It is possible to enjoy the Truth and then forget to check whether this means that I have to change my life. Which I have to, if I am faithful in the light. I cannot say I have been that, certainly not by the standards of this man, who is barely even known by most Christians in his native Norway, not to say anyone else. I think he deserves more recognition. And I deserve less. For I suspect that the reason why I let this book gather dust for years while I sought the Truth in books from faraway countries and times, was the same reason why it impresses me so much: The blinding brightness of it, that is unbearable if one has something outside of God’s will, some small thing or two or ten hidden in dark places. Things that seem a good idea to conveniently forget until just before one departs this world. In Buddhism these strange addictions are simply called “attachments”. In the language of Smith’s friends they are living sacrifices. When God wants a sacrifice, we should give it while it is alive and kicking and struggling. Tie the sacrifice with ropes to the horns of the altar! It will probably be easy to give up your favorite sexual fantasy when you’re 88. Or computer games when you’re going blind. Lots of attachments also die naturally while we are still in our prime, as my journal since 1998 clearly documents. There were many things that were dear to my heart at some point in my early journals that I now am happy to be rid of. And that is good. But the God of J.O. Smith is one who demands sacrifice. Not because he needs anything, probably not even likes to see us squirm, but because he sees that we need to be free from our attachment so we can see clearly, think clearly and act boldly. “It is like killing your pets” I wrote in my journal when I unpacked more than 100 old computer games I did not even play anymore, and threw the paper, plastic and disks in their separate garbage. But if I have 101 pets scampering around my spiritual feet at all times, I will not be able to run the race of salvation, not only my own but that of the world itself. A great amount of Light is needed for this world to even survive the times ahead. I wish I could remain here and contribute to that. But unless I bear the living sacrifices into God’s temple (to use the Old Testament symbolism), I will not be part of the solution but of the problem. This entry was posted in religion and tagged Smith's Friends by itlandm. Bookmark the permalink. I like this entry very much. Hi. i live in australia. a cousin of mine gave a couple of small books by some of the early believers in this way. people like sigurd bratlie and elias aslaksen. how can get more? 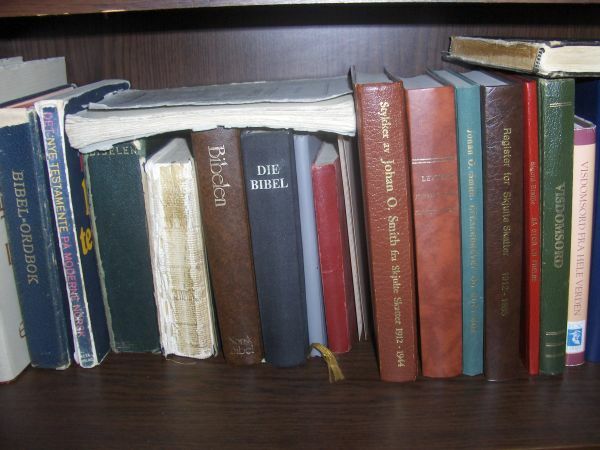 The books of the Way were sold at conferences and also locally in many towns where the Church had its own locale. They are not sold on amazon.com except occasionally as used books. There are assemblies of Brunstad Christian Church Several places in Australia. I recommend http://www.brunstad.org to get in contact with them. At least back when I was there, we were not hostile to outsiders. The more people who know the Truth, the better!